“We’re starting at the beginning. Gentlemen, this is a football.” And so the story goes about Vince Lombardi and his plethora of quotable sayings. 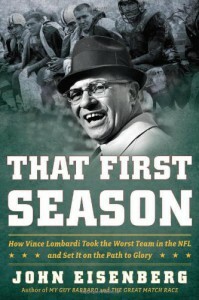 Thanks to the excellent writing of John Eisenberg, many of my misconceptions of Lombardi have been cleared up. For instance, Lombardi said this quote in sarcasm as a response to a pitifully run (in Lombardi’s opinion) practice. Player Max McGee retorted, “Coach?...Can you not go so fast?” As Eisenberg wrote, practice went much better the next day. I come to this book as a non-fan of football. I don’t watch it; I don’t follow it; I am clueless about the plays. Why read this book? Because of Lombardi—his legend extends beyond the stadium. This book was exactly what I was looking for, and more. The author did a brilliant job of describing what happened, bringing it all to the personal level. Eisenberg made it feel like we are sitting with Lombardi during his family dinner. We’re there in the locker room. We’re there during practice. Eisenberg states his sources and makes special mention on what is supposition (anything written in italics). It is a brilliant format that reads incredibly well. My unlikely appreciation came from learning about the players themselves and the history Green Bay’s team. It’s like a David and Goliath type of story. To hear Eisenberg talk (that’s what it felt like—not like reading) about Golden Boy Paul Hornung, feeling doubtful of his future, or about Bart Starr, not knowing if he’s good enough, was a true joy. As a non-football fan, the second half went a bit over my head. It was still good, but the beginning half was exciting for a football noob like me. Many rich details about games and maneuvers were given. Any football fan will be stoked reading this all. Eisenberg has a talent for making history not only palatable, but enjoyable.